Too Close For Comfort was a 30 minute comedy series on ABC about two sister who were barely adults. They lived together in one half of a duplex and their parents lived in the other half. The young ladies wanted to be treated like they were grownups and their conservative and overprotective father wanted to treat them like they were still little girls. That conflict in attitudes made the Rush family's living arrangement a little "Too Close for Comfort"! There was also a warmer aspect to the show, however, as the daughters often decided that it was nice to have their loving parents, including dad, close enough for comfort! Too Close for Comfort was based on a British series titled, "Keep It In the Family". Brian Cooke created that series along with another named, "Man About the House". That series was the inspiration for another American TV show, "Three's Company"! The Rush's home was a two story Victorian house that had been converted into a duplex. It was located at 171 Buena Vista Avenue East in the Haight-Asbury section of San Francisco. Mom and Dad lived upstairs and the daughters lived downstairs. Jackie Rush was a 21-year-old brunette who worked as a bank teller and was also trying to start a career as a fashion designer. Sara Rush was an 19-year-old college student who also worked at several different jobs throughout the series' run. Henry Rush was a cartoonist who worked mostly at home on his comic book titled, "Comic Cow" and Muriel Rush was a freelance photographer. Jackie and Sara's apartment came available when the transvestite tenant downstairs died. You might notice below at the episode information that Too Close For Comfort didn't debut until the middle of November. It wasn't a mid-season replacement. There was an actor's strike and nearly all shows of the 1980/1981 season were delayed by several months. Ted Knight wore a sweatshirt on one episode of Too Close for Comfort that had a real-life University's logl on it. The series had a huge percentage of college students in its audience and started sending Ted hundreds of University's sweatshirts. Mr. Knight went out of his way to don as many t-shirts as possible each episode after that in order to satisfy his fans! During a second season episode, viewers learned that Muriel Rush had been adopted. Her biological mother was a woman from England who had an affair with her American soldier father during World War II. It was also disclosed that almost immediately after Muriel was born her mother had become a nun! If you never saw Too Close for Comfort, you may still remember Ted Knight from his role as "Ted Baxter" on seven seasons of "The Mary Tyler Moore Show". Too Close for Comfort was still doing decently in the ratings when it was canceled. 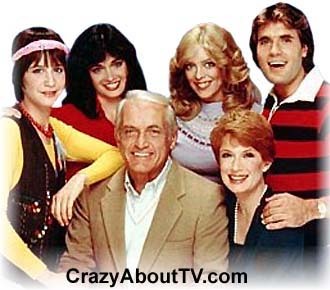 Unfortunately, Ted Knight died. Even though ABC had already decided to renew Too Close for Comfort for a seventh season, the series was so much about Henry Rush's relationship with his daughters that they probably couldn't see any way to salvage it. Thank you for visiting our Too Close For Comfort page!